“In the face of death, live humanly. In the middle of chaos, celebrate the Word. Amidst babel . . . speak the truth.” These words were written by William Stringfellow over 40 years ago and they pretty much summarize the message of today’s gospel reading. In the face of a living death, the man was released to live “humanly” (what a marvelous word). In the face of the chaos that “Legion” had created in his soul, the Word (Jesus, the incarnate Word) brought release and peace. And in the face of the babel of unbelief and rejection, the man was empowered to speak the truth to his fellow countrymen. I have often said that the miracles of Jesus are parables in action. Certainly that is true today. But today the lesson is deeper. We, every one of us, is a parable – a parable of the Word, a parable of what Jesus brought into the world. When we are captive to our thoughts and are easily tempted to be something we don’t want to be, we become parables of the fall. When we rise above our thoughts and temptations, we become parables of the liberation that Jesus brought into the world. Jesus brought this power of liberation… to the man whose name was “Legion”; and also to us who hear the gospel story here in the Liturgy. We are all “possessed” in one way or another – hopefully not by demons, but certainly by the concerns of daily life and by the anxieties brought on by our captivity to the values imposed upon us by today’s mass society. And yes, there is evil waiting at the door to ensnare any one of us, and we need protection from that evil. The Lord’s Prayer concludes with precisely that need: deliver us from evil, or the evil one! The gospel today calls every one of us to live fully, passionately, “humanly”! Then joy and peace replace any “legion” of fears and anxieties in our lives. And we become parables of the Word. Today is the feast day of St. Luke, the Evangelist, “the beloved physician,” as St. Paul calls him in our reading today from the Letter to the Colossians. Luke wrote one of the three ‘Synoptic Gospels” and one can easily see it is the most artfully and best written of the three! It is a work of literature in addition to being a gospel. He even wrote a sequel. 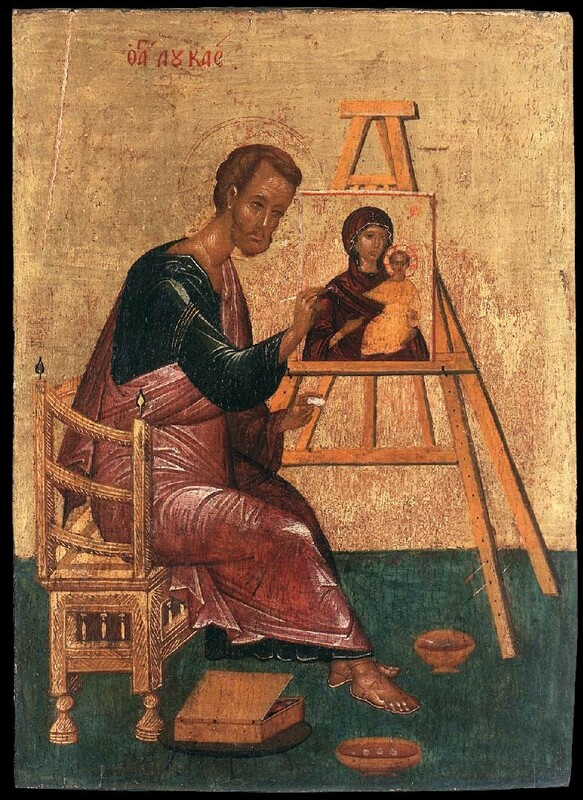 Tradition also says that he ‘wrote’ the first icon, an icon of Mary. There’s no doubt that he had close contact with the mother of Jesus, as evidenced by the various episodes of Mary and Jesus’ childhood that only he wrote about. So Luke was a painter of words and images. And indeed, his gospel has more memorable images than any of the other gospels. Luke was very creative in his arrangement of the actions and sayings of Jesus. One good example is the incident of the sinful woman who anointed his feet (Luke 7:36-50). All four Gospels have this incident in one form or another (Matthew 26:6-13; Mark 14:3-9; John 12:1-8); but in Matthew, Mark and John the incident is part of the passion week narrative and Jesus takes the anointing as a preparation for his burial. Luke transfers the incident to a much earlier time where it has no connection with Passion Week. And instead of a preparation for his burial, Jesus calls it an act of love, because “she loved much” (verse 47). In Luke’s version, the story is less about Jesus and more about the woman! Luke showed greater sensitivity to women than the other Gospel writers, and he showed women playing a significant role in the life and ministry of Jesus. Luke’s greatest literary innovation comes in chapters 9-19, the journey to Jerusalem; a true literary unit into which he also integrated various scattered sayings which Matthew had collected together in the Sermon on the Mount. This was the freedom of the gospel writers, to mix and match and reorganize the material that had been handed down about Jesus. Fundamentalists worry about finding an explanation for every little discrepancy among the four Gospels; but the gospel writers were not fundamentalists! They were artists of faith, and we are called to be likewise. 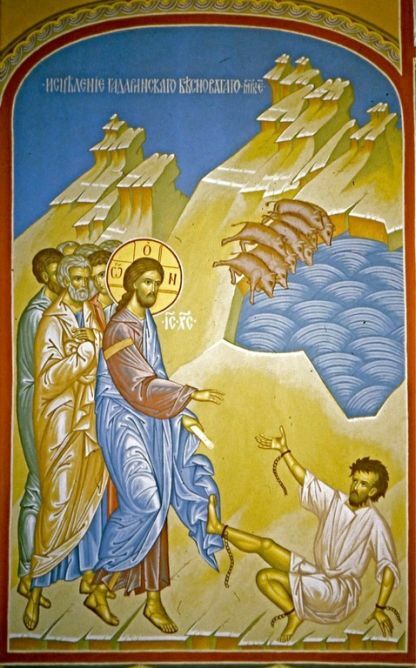 Luke’s narrative of the journey to Jerusalem begins with an amazing phrase: καὶ αὐτὸς τὸ πρόσωπον ἐστήρισεν τοῦ πορεύεσθαι εἰς Ἰερουσαλήμ (9:51). This is a Semitic expression, meaning Jesus “fixed his face to go to Jerusalem” – a determined move, with a sense of finality. And into this determined final journey to Jerusalem, Luke inserted several parables that the other three Gospels do not have and all of which are brilliant short stories with characters that stay in the mind for a lifetime: the Good Samaritan (10:25-37); the Rich Fool (12:13-21); the Prodigal Son (15:11-32); the Rich Man and Lazarus (16:19-31); the Pharisee and Tax Collector (18:9-14). Luke did not hesitate to use parables that featured questionable characters and motives, for example the parable of the Widow and the Unjust Judge (18:1-8). But the most remarkable example of this type of parable is the one of the Dishonest Manager (16:1-13). Talk about mixed messages in a parable told by Jesus! No wonder the other Gospel writers did not include it. But Luke did, and it shows his deeper experience with business and the ways of the world. He was a professional man, after all. It’s a fearless move on his part, to include a parable with such an unconventional message – unconventional for Jesus, that is. 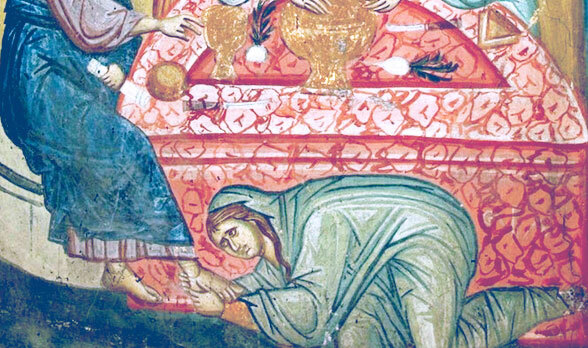 But note the other remarkable thing that Luke did: he closed the parable with the famous words of Jesus, “You cannot serve God and mammon” (verse 13). Matthew included these words as part of the Sermon on the Mount (Matthew 6:24). Instead of Matthew’s moralizing use, Luke places this statement in a much more nuanced, even ambivalent context – another example of Luke’s literary qualities and more complex ambitions. Near the end of the journey to Jerusalem Luke tells us about Zacchaeus in the tree (19:1-10), a living parable, so to speak, that brought to a focus all the teaching that came before. 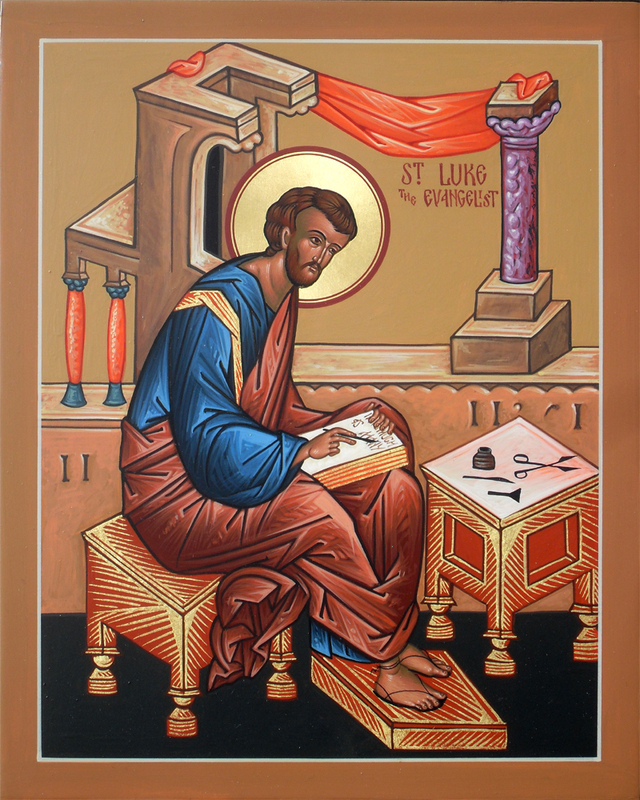 And like an iconographer, Luke gave us vivid images of why Christ is on earth, who God is, and who and how we human beings are. The meal with Zacchaeus was one last opportunity for Jesus to show his openness to be with everyone; one last opportunity to shock people who are offended by God’s open love – something Pope Francis has experienced in the last two weeks from the harsh criticism he has received from cardinals who have no use for Jesus and his love for Zacchaeus. After the meal with Zacchaeus, Luke tells the familiar story of what we call Holy Week. But then comes the Emmaus incident after the resurrection (Luke 24:13-35), and the Ascension which closes the Gospel (Luke 24:50-53) but leads directly to the beginning of the Book of Acts. Luke tells us about three meals that sum up the impact of Jesus in our lives: (1) the meal in Zacchaeus’ home, which I see as Jesus’ last meal with the humanity that he came to seek and to love; (2) the last supper with his own disciples, which completed his fellowship with those who would bring his message to the world; (3) and the Emmaus meal, that opens up to all eternity and embraces us every time we gather for the eucharist in the Liturgy and we see the risen Christ. I had never before seen the importance of these three meals in the Gospel of Luke. My respect and admiration for this Gospel today is deeper than ever. Luke is a man for today and for all seasons, a man who used every artistic and literary means at his disposal to give us the fullest and most engaging picture of Jesus. This is what the church is called to be. This is how we are called to be: artists of the Christ-like life, artists of faith! Categories: Biblical Explorations, Sermons | Tags: God's open love, Gospel as literature, Jesus' journey to Jerusalem, Luke the Evangelist, meals of Jesus, parables of Jesus, Third Gospel | Permalink. 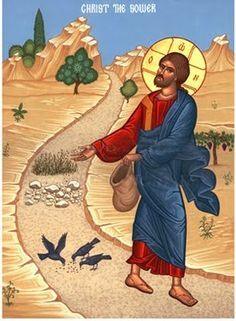 The parable of the sower and the seed: We read it today from Luke’s version (Luke 8:4-15). This is the parable of parables. It is the parable that provides the key to all Jesus parables! Because we hear from his mouth what is the purpose of parables and what is the pedagogy that Jesus employs. A parable is a simple story from nature or from human society that is nevertheless meant to be more than a simple story. It is meant to be more than a lesson in being nice. Jesus was not interested in teaching people to be nice! The parable is meant to teach the mysteries of the kingdom – the secrets of the kingdom (τα μυστήρια της βασιλείας του θεού). Luke places this parable differently than Matthew and Mark. Matthew 13 is a chapter of parables of the kingdom: the kingdom as seed, the kingdom is like good seed growing with weeds, the kingdom like mustard seed, the kingdom like yeast, the kingdom is like buried treasure, the kingdom like pearl of great price, the kingdom is like a net cast into the lake. Mostly images from the life of the people who heard Jesus: seed, farming, baking bread, catching fish – pearls and buried treasure, perhaps not so everyday, but things that people often dream of finding, much like people today might dream of winning a big lottery. Images from life – but why hard to understand? Jesus uses words and images to describe how the Word of God works. They remain as words and images to casual listeners. But don’t just listen to the words! “Words, words, words, I’m so sick of words,” Eliza Doolittle cried out. “Words, words, words,” Hamlet mutters in Act 2 of Shakespeare’s tragedy. Words can be tiresome, words can be slanderous and deceitful. Jesus used words and images – on the surface obvious, but hiding deep truths which are revealed only to those who have more than ears and eyes; to those whose hearts are eager. While Matthew used this parable as the opener for a whole series of shorter parables, Luke followed this parable not with other parables, but with some miracles that showed the message of the parable in action. But first Jesus had to deal with his mother and brothers (8:19-21), who came to see him, perhaps to take him away before he got into trouble. Once a Jewish mother always a Jewish mother. Jesus dismisses them in rather harsh manner: My mother and brothers are those who hear the word of God and do it. See? That’s the parable right there – it’s not just about hearing. Jesus calms the storm (8:22-25). Jesus heals the woman who was bleeding for 12 years and raises to life a dead girl (8:40-56). Do you know what I see in these miracles? The real answer to the parable. It’s not as hopeless as it might often appear. The seed that falls on the path? Like the woman with the hemorrhage, ignored, set aside by society? The seed that falls on rocks? Like the demoniac perhaps? The seed that falls among the thorns? Perhaps like the disciples in the storm-tossed boat or the parents of the dead girl, choked by the circumstances? But do you see the hopeful answers that all these miracles offer to the parable? Can anything be more hopeless than a man possessed by a whole army of demons? Can any heart be more barren and rocky than the heart of that poor soul? No matter how hard, how arid and dry, how full of thorns our life is, the seed can still produce fruit. I had never realized this before, but here it is: The real answer to the parable is not in the allegorical interpretation that the Gospel writers put in the mouth of Jesus. The real answer to the parable is in the miracles that Luke recounts after the parable! God our Father, your word is accomplished in the coming of your Son. Today it is offered to us in this eucharist. Send us into the world as bearers of the Good News that sets human beings free from this moment forward, forever. Amen. NOTE TO MY READERS: I have not done much writing lately, and I had no sermon last Sunday (Oct. 4th) because that was the Sunday of our Bishop’s visit and he gave the sermon. I hope that in the weeks to come I’ll be able to post some Bible studies in addition to Sunday sermons. Some physical problems are also playing havoc with my computer time. Categories: Biblical Explorations, Sermons | Tags: Jesus parables, parable of sower | Permalink.